Volunteers from FIU hydrate the runners as thousads cross the bridge to Belle Isle. 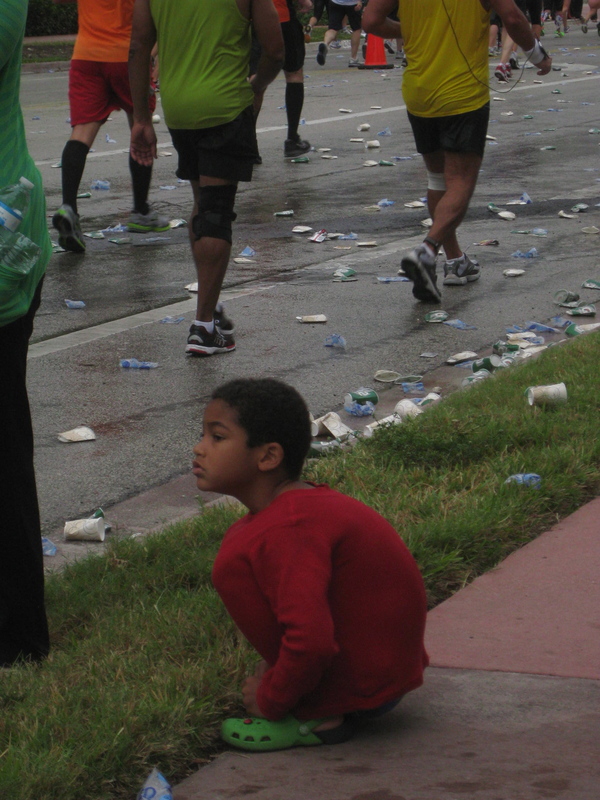 Fast or plodding, amid splashes of clear water and green Gatorade, the 25,000 runners in Sunday’s 10th ING Miami Marathon brought cheers and energy as they crossed Belle Isle and the Venetian Causeway. 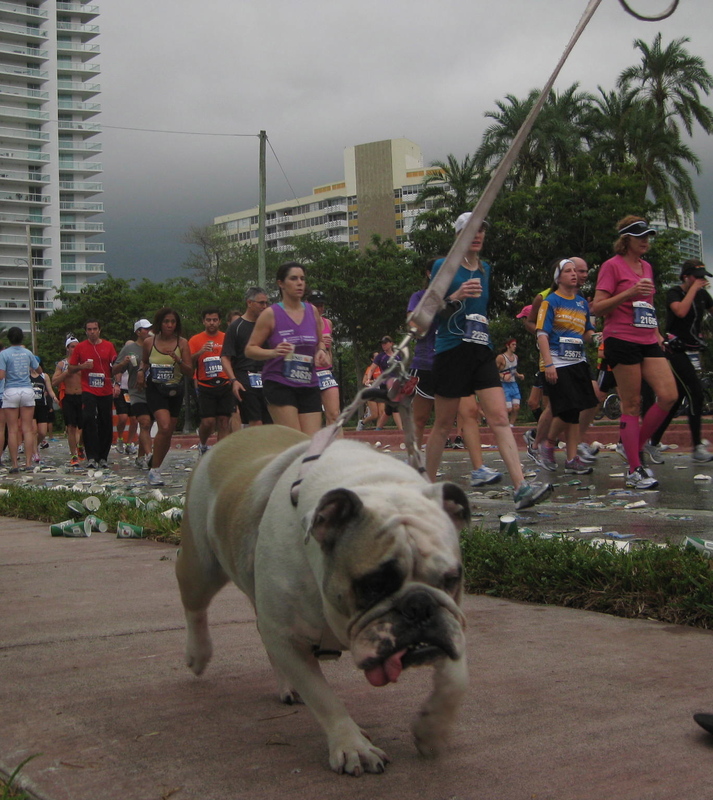 The race ended up with the closest finish in marathon history. But the story on Belle Isle was the achievement of all the mid-pack runners, the folks who trained to prove something to themselves, to make a statement for a loved one, to raise money for a cause. Eager volunteers from Florida International University staffed the Belle Isle water station before 5 a.m. to fill cups with Gatorade and water while preparing energy snacks for the runners. One of the first wheelchair runners reaches Belle Isle. 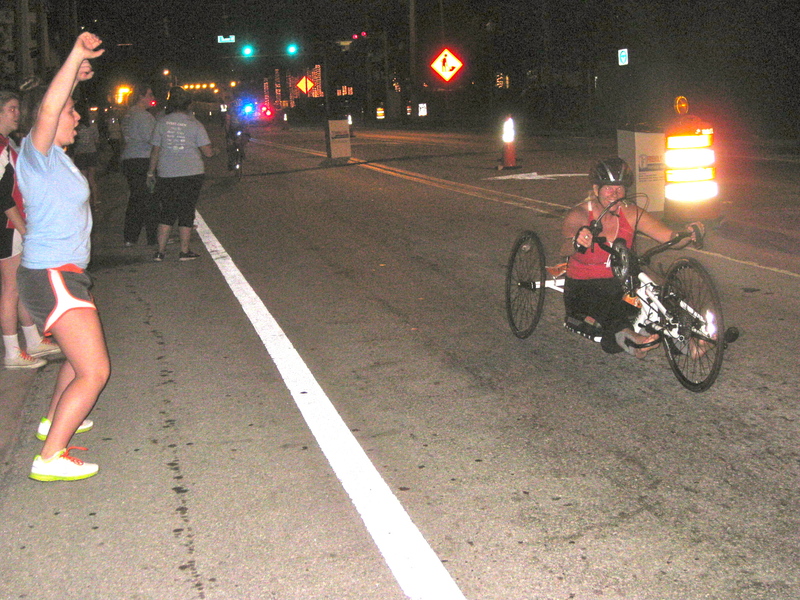 The first wheelchair competitors crossed the island at about 6:25 a.m. (after a 6 a.m. start); the first runner reached Belle Isle at just before 7 a.m., about 41 minutes after the elite runners got going. The first of the elite runners reaches Belle Isle in under 41 minutes. 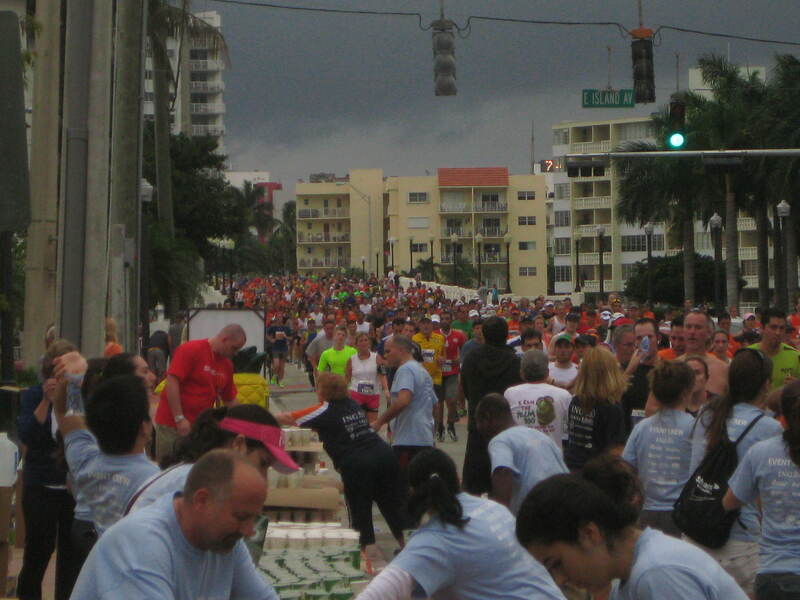 Just as the sun began to rise, a bank of clouds blocked the sun, great news for the runners. It was a little warmer than most of them wanted, but overcast skies kept temperatures down for a good portion of the run. The elite runners just fly by. It's a blur! 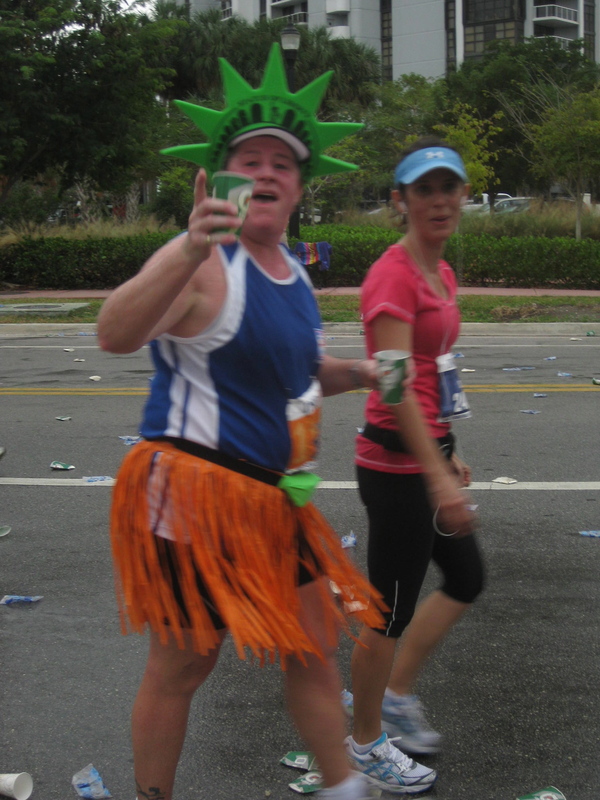 As usual, the race brought out some inventive running apparel. 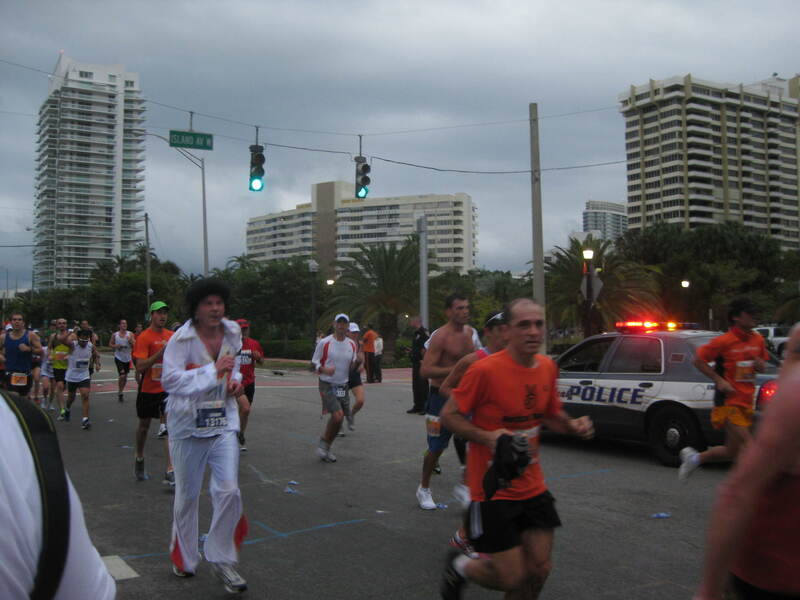 Elvis was running about a 7:10 pace. Dennis "Coatman" Marsella always makes the marathon. 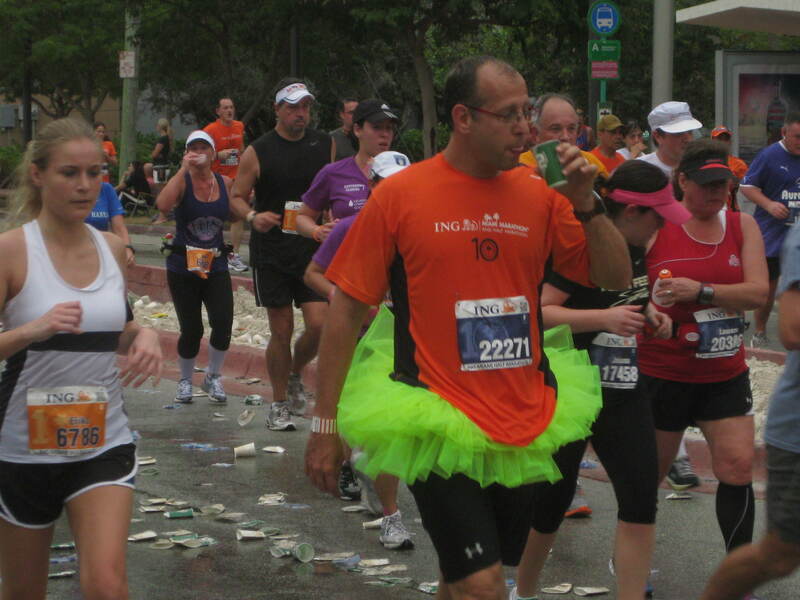 And this tutu is a little too-too. The crowd cheering them along included friends, family, passersby and Belle Isle residents who just got out early to be a part of the event. 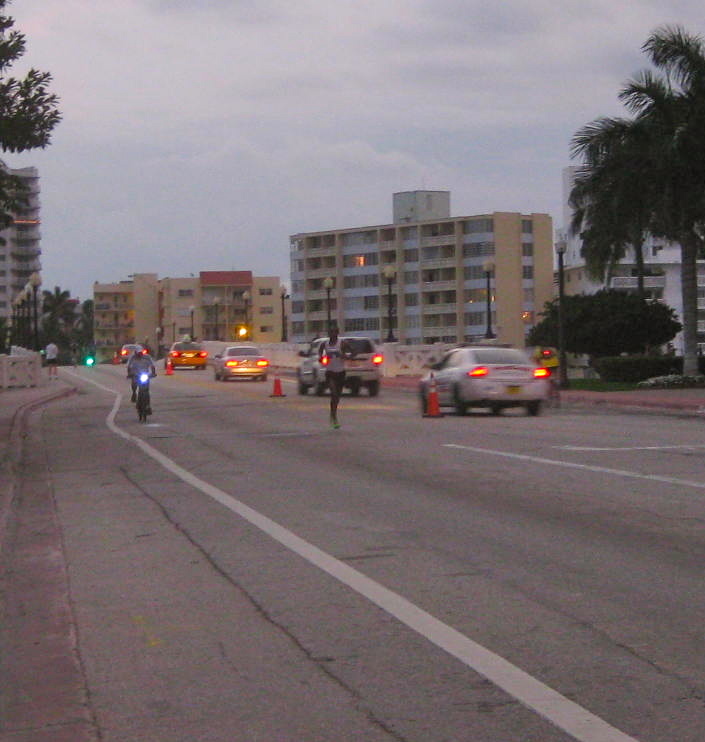 Although the race causes disruption for a few hours on Sunday morning, it showcases all the Venetian Islands as the runners head from Miami Beach back to the city of Miami. 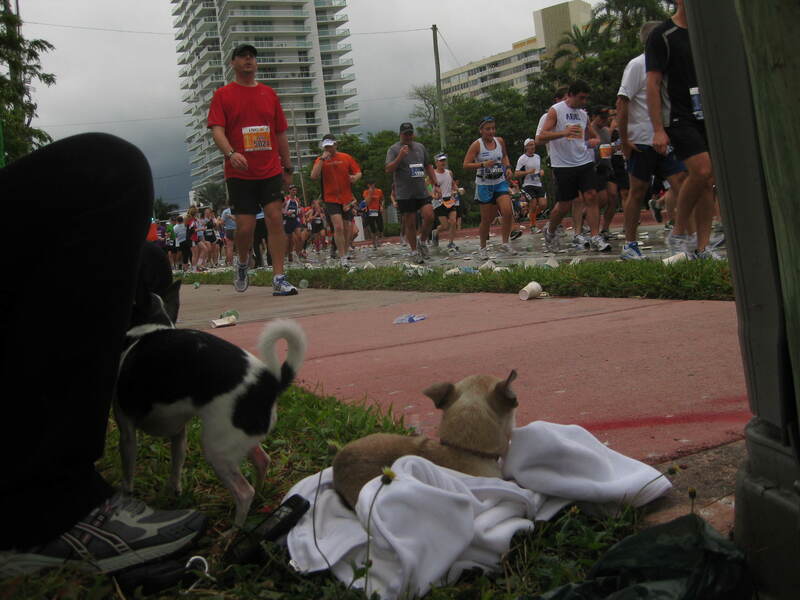 We also saw a good number of pets out to cheer the runners. Mile 8 seems a little early to be out of breath. Watching the race -- and not watching the race. 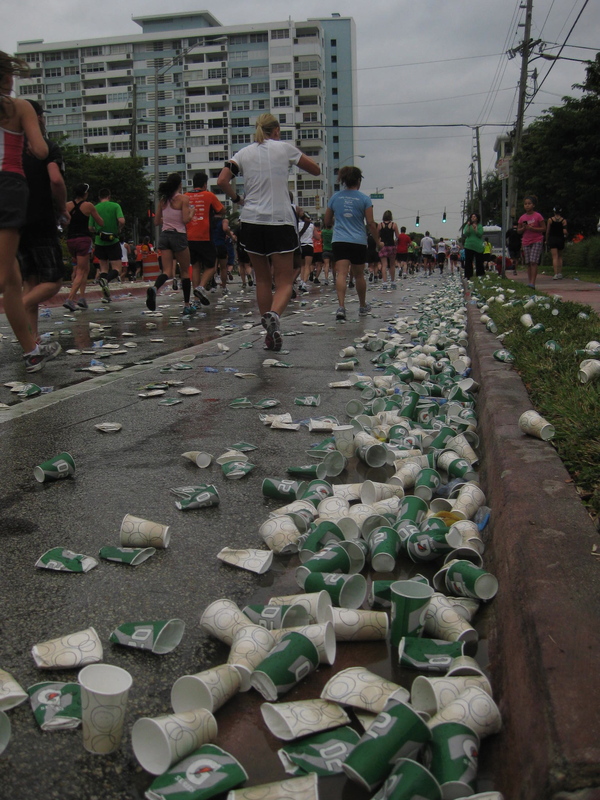 As usual, the horde of runners left bushels of crushed cups in its wake. But with almost military precision, race organizers cleared the route within hours of the last runner’s footfall. Here’s a gallery of other great moments. 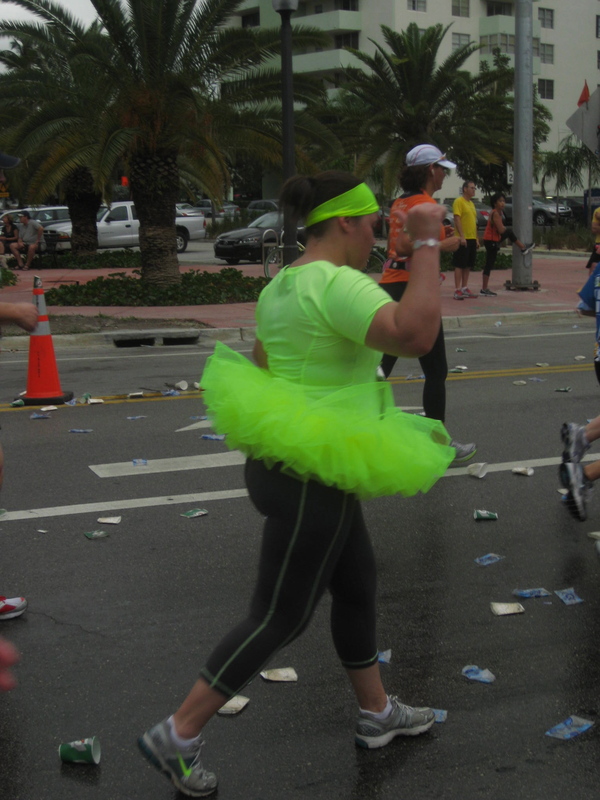 We have more than 100 photos of groups of runners. Maybe you are in there! One of the first Team Achilles runners at Mile 8. The first runner to reach Belle Isle. The first runner reaches Belle Isle. 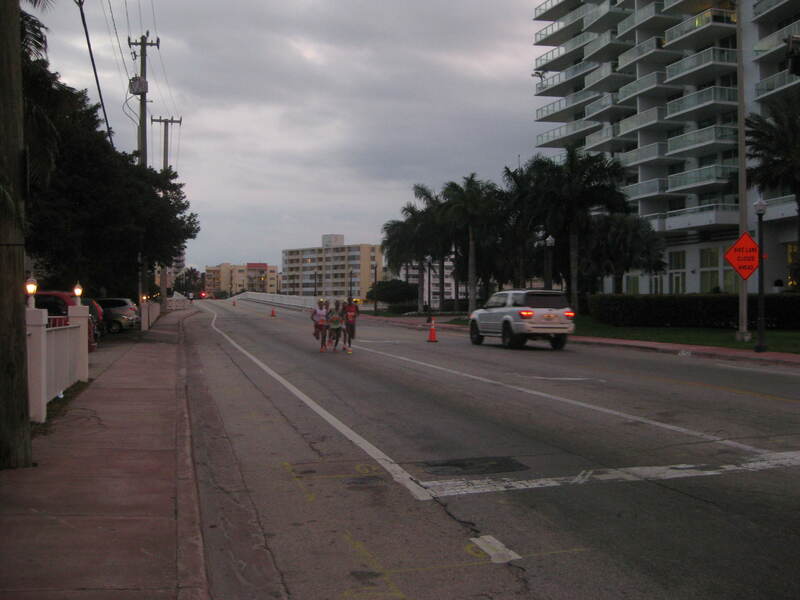 The first of the elite runners reached the island just under 41 minutes from the start. 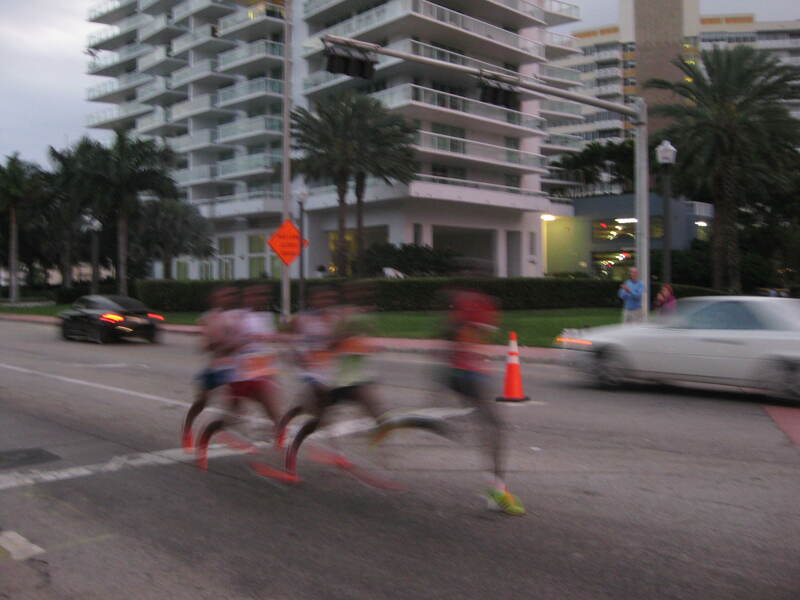 The elite runners just fly by. 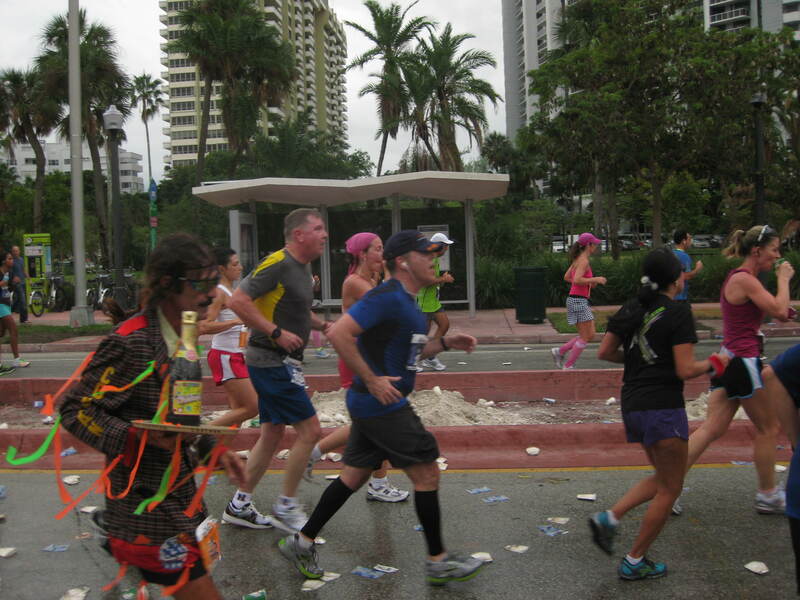 Dennis “Coatman” Marsella always makes the marathon. Watching the race — and not watching the race.